Download the latest camera database for your Garmin. Stay aware of safety cameras throughout Europe and travel safely, legally and speed-consciously. 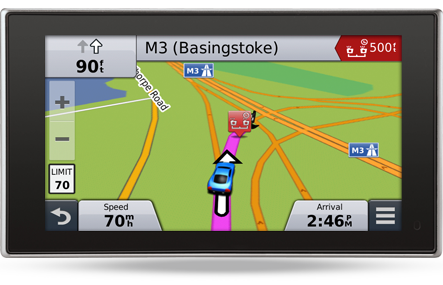 Every compatible Garmin has the full Cyclops safety camera database pre-loaded to notify you of speed limits on the road that you are travelling on and the presence of safety cameras. Keeping to the speed limit and being accident-free will make the roads a safer place and will help you maintain lower insurance premiums and avoid penalty points and fines too. Garmin is partnered with safety camera experts Cyclops to provide a reliable safety system so you can relax, knowing you’re driving safely and legally. All compatible Garmin sat navs come with a full Cyclops safety camera database pre-loaded. Found a new safety camera? Report it to us using our report form. Provides unlimited safety camera updates for the selected region throughout the year. This option will keep you up to date as safety cameras are relocated and added. A one-time update provides an inexpensive purchase option to update your complete set of safety cameras for your selected region. A 30-day free trial allows you to test out the service free of charge. Updates can be downloaded to your device throughout the free trial period. Ensure you’re always up to date with safety cameras, including locations of mobile sites through the Cyclops safety camera community. The Cyclops safety camera community collects and shares up to the minute safety camera reports from a large community of mobile phone and Garmin GPS users to keep you informed. This is provided to your GPS via a Smartphone Link App which you can download for FREE on your smartphone. Download the app from the App Store or Google Play to your smartphone and purchase live updates.